Permission for display of these inscriptions has generously been given by the authors, David and Gordon Killicoat . You may download and view these pages for personal research purposes only. No further use or distribution is authorized. 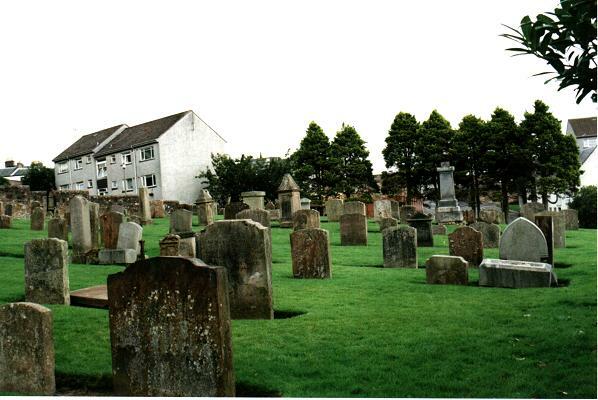 Transcriptions of Kirkmichael and Straiton Churchyards by David and Gordon Killicoat are also available for sale through the Maybole Historical Society. A supplement to the Monument Inscriptions below has been contributed by Ian Heath of Redding, California. I went through the Kirkwynd cemetery transcription to see if any of these were relatives. I can't make a connection, but what I have done here is compare the names against the OPR as extracted from the Scottish Church Records ... The result is in an attached file. To download this file in a Rich Text Format click here or Microsoft Word format click here. Another less formatted version is available in HTML format here. The surname index follows the monumental inscriptions. Click here for the plan showing the location of each monument within the cemetery. In memory of WILLIAM NIVEN of Kirkbride dec. 13 Dec 1844 aged 85. 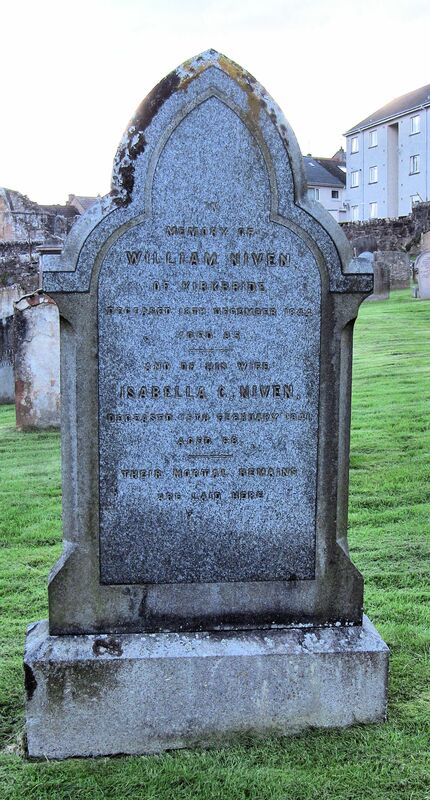 And of his wife ISABELLA C. NIVEN dec.  Feb 1841 aged 68. Their mortal remains are laid here. Click here for photo. Click here for more about this tombstone and WILLIAM NIVEN. 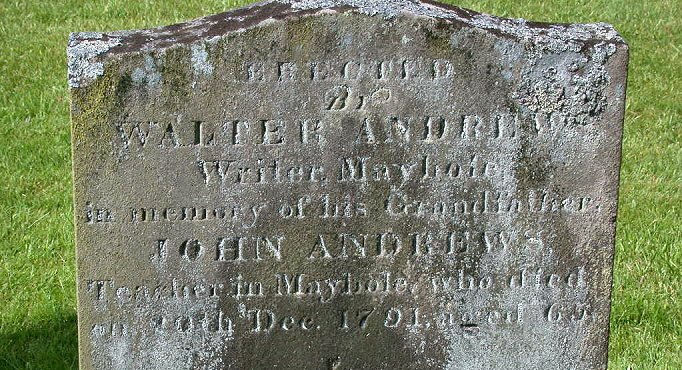 Erected by WALTER ANDREWS Writer Maybole in memory of his grandfather JOHN ANDREWS Teacher in Maybole 20 Dec 1791 aged 65. [Reverse] This burying ground extends 12 ft East by 9 ft North. Photo of monument. Click here for another photo. And here for same photo wider view. Also here to view the inquiry of a family historian whose ancestry includes these indivduals. Erected by ANN WATSON in memory of her husband HUGH HAMILTON died ..... Mar 1863 aged ...... And her youngest daughter MARGARET died .......Nov 18........................... her sister MARGARET WILSON died 9 ..... 18.... aged 20. 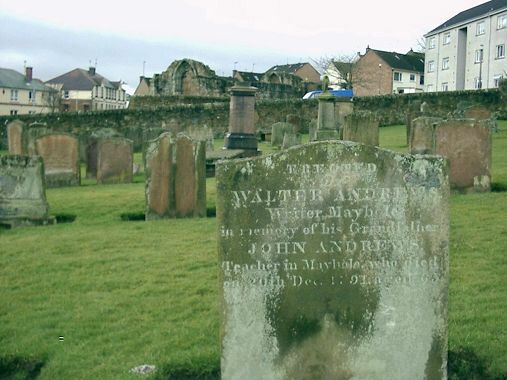 In memory of JOHN MURDOCH Manufacturer died at Maybole 7 Sep 1880 aged 86. Also his wife HARRIET McRONALD died at Glasgow 26 May 1871 aged 72. A few short years of evil past who reach the happy shore where death-divided friends at last shall meet to part no more. Click here for photo. And here for a MURDOCH descendant. Erected by JOHN MURDOCH Merchant Glasgow in memory of SARAH HEPBURN his mother died 16 Jul 1831 aged LXX yrs. Also his father JOHN MURDOCH died 1 Sep 1850 aged XCI yrs. Click here for photo. [Tablestone] Heir lyis ane honest man MOREIS MAKMORRIE and his spous quha deceist in ye last of October 1618. Prisca domus numerosa suos murrea relinquit hic qintres queis me mauritius posuit IOHNE MAKMORRIE. AGNES MCILVEN. [side] Repaired by JAMES CRAWFORD Grandson of the late JAMES MacMURRAY of Cultizown. 1830. Ground 7½ feet East by 3 feet North and South of the centre of this stone.